Clayton King addresses those who came to kneel at the altar. Married for almost 19 years, the couple admitted that they are still fighting for sexual purity in their relationship. The duo stressed that the blood of Jesus is what makes one pure. 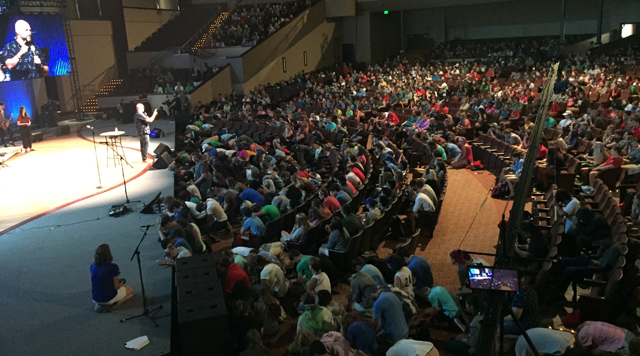 They encouraged students to get into Scripture and to know the Word of God. “When God says ‘don’t,’ He isn’t saying, ‘Don’t hurt yourself.’ It’s from a heart of love,” he said. They ended with Clayton encouraging those who had never given their hearts to Jesus to do so. About 14 people responded to the invitation by a show of hands. In an “old-fashioned altar call,” He invited them to come forward, along with others, and kneel before King Jesus, turning the platform into an impromptu altar. Previously in the session, Courtney Cherest spoke about the importance of prayer. “It’s not about how we do it; it matters who hears us,” she stressed. Two students read the scripture for the morning, Psalm 17:6 and 1 John 5:14-15. 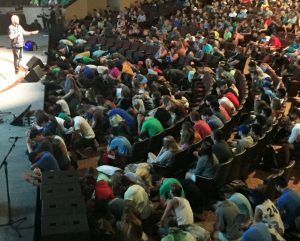 Timothy Kurtaneck and Jeff Bogue reminded students of two upcoming events in the week — one when students who are considering a full-time call to ministry will have an opportunity to respond on Saturday night; and the National Youth Offering, which will be taken at tonight’s main session and will benefit the new Urban Hope Los Angeles. The conference, which is sponsored by CE National, began last evening at Indiana Wesleyan University in Marion, Ind. It continues through Sunday morning. Students from 92 churches are participating, including nine that are new to the event. A total of 2,175 students, youth leaders, guests, and others are attending. This afternoon, students had the options of a variety of activities, including sports tournaments, open activities, and off-campus ministry opportunities.